Following an interesting thread on Twitter prompted by AlexRoddie’s follow-up review of the Trailpix ultralight tripod I’ve been thinking about tripods and backpacking. The first question is of course whether you need one. Say no to that and you’ve saved some weight and bulk but also limited the scope of your photography. I didn’t carry a tripod for quite a few years. In fact it never occurred to me to do so. 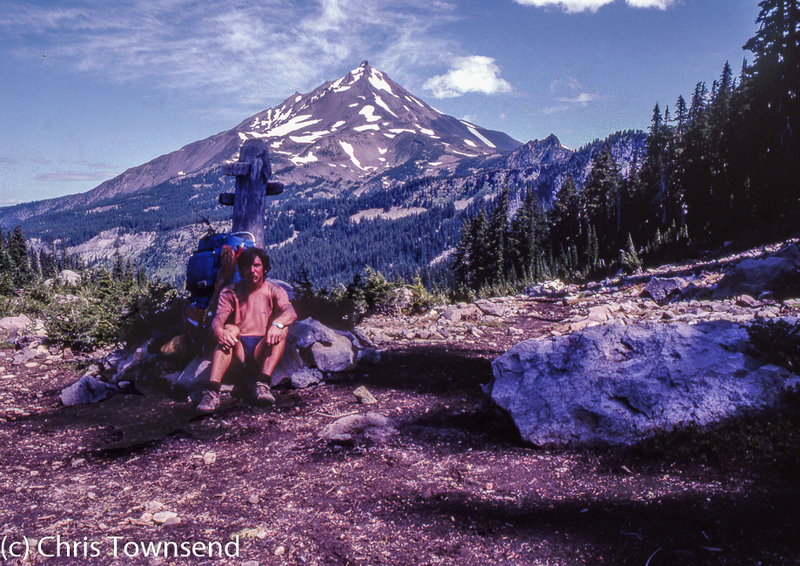 Looking back at my pictures of the Pacific Crest Trail and Continental Divide Trail I wish it had. Two types of image are missing from those trips. Low light shots –dawn, dusk, night skies – and many self-portraits. The few of the latter I have were taken by people I travelled with or by balancing the camera on a boulder, tree stump or pile of stones - that’s why I’m quite often sitting down in the few pictures I have! So the two reasons for carrying a tripod are low light images and, for solo backpackers, self-portraits that go beyond close-up selfies. Often I’m taking pictures of myself not as a selfie but to show someone hiking, cooking, pitching camp and doing other activities. Modern cameras with in-built stabilisation and good results from high ISOs do mean that reasonable images can be taken in low light conditions where it wouldn’t have been possible with low ISO films but even so I’ve not found I can handhold them for starry skies or even a dark sunset. It was after my 1985 CDT walk that Peter Lumley, the publisher of Footloose, an outdoor magazine I was then editing, asked me why I didn’t use a tripod. I suspect he’d have liked more pictures of me for my articles on the trail. I remember that I replied ‘too heavy’. Rather than argue Peter showed me his own tripod. I don’t remember much about it except that it felt amazingly light. I borrowed it for a forthcoming trip to Iceland and was delighted with the opportunities it opened up. I’ve carried a tripod on every trip ever since. Looking for my first tripod after the Iceland walk with an arbitrary maximum weight of 1kg I quickly realised that most tripods were indeed too heavy, and that included ones described as ‘lightweight’. Only a few budget and ‘travel’ tripods seemed worth considering. I ended up with a Slik 500G tripod which, as the name says, weighed 500 grams. I took it on my walk the length of the Canadian Rockies in 1988. By the end of the walk the centre column wouldn’t tighten anymore but I had taken quite a few pictures I couldn’t have taken otherwise. I replaced that tripod with a 600 gram Cullman 2101 Backpack tripod which I still have and which has proved excellent. It went on five multi-month walks and dozens of shorter ones. Eventually the ball head would no longer hold the camera firmly but given the use the tripod had had I couldn’t complain. At some point I’d also purchased an expensive Gitzo Loisir tripod as a possible replacement. It was more compact than the Cullman but heavier at 790 grams and not as tall. It did have a good ball head though so I transferred this to the Cullman. I still have the Loisir but haven’t used it in many years. When I changed from SLRs to smaller, lighter mirrorless cameras some seven years ago I started to think about a smaller, lighter tripod and eventually bought a 281 gram Velbon V-Pod. This has also proved excellent and has lasted longer than I expected. I used it on my Scottish Watershed walk and it’s been on many other trips. What about mini tripods? I’ve tried a few of these and I do have a Joby GorillaPod. I rarely use it though. I find such tiny tripods too low for most uses. Anything much shorter than the V-Pod would be too limiting for me. I also have two heavier tripods, one of which I very occasionally take on day walks. The Manfrotto 724B Digi Tripod weighs 1432 grams and was bought for use at home photographing gear, books, magazines and other stuff. Then just last year I bought a 1330 gram Benro A350F tripod for a very specific purpose – photographing transparencies on a light box, which requires a reversed centre column. I can’t imagine taking either of these tripods on a backpacking trip. I’m aware though that many regard these as lightweight tripods. Good though it has been my V-Pod is somewhat battered now. I hope it lasts a fair bit longer but I won’t be surprised if it doesn’t so I’ve been looking for a replacement. 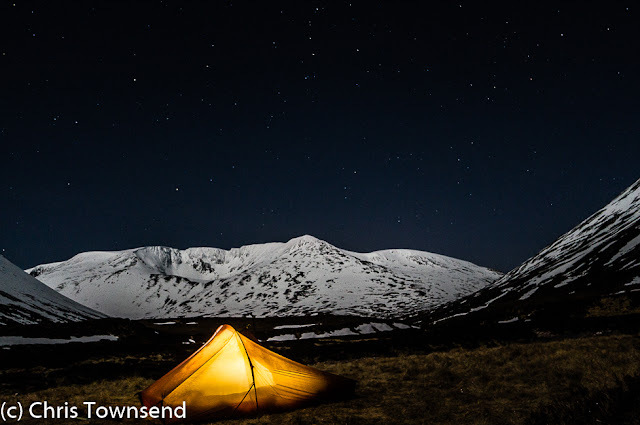 Read Alex Roddie’s post to see why I’m not considering the Trailpix. I’d buy another V-Pod but it’s been discontinued. The nearest Velbon offers now is the Summit Tripod at 396 grams. That’s the heaviest I’d consider. Maybe I’ll buy one before it disappears too. 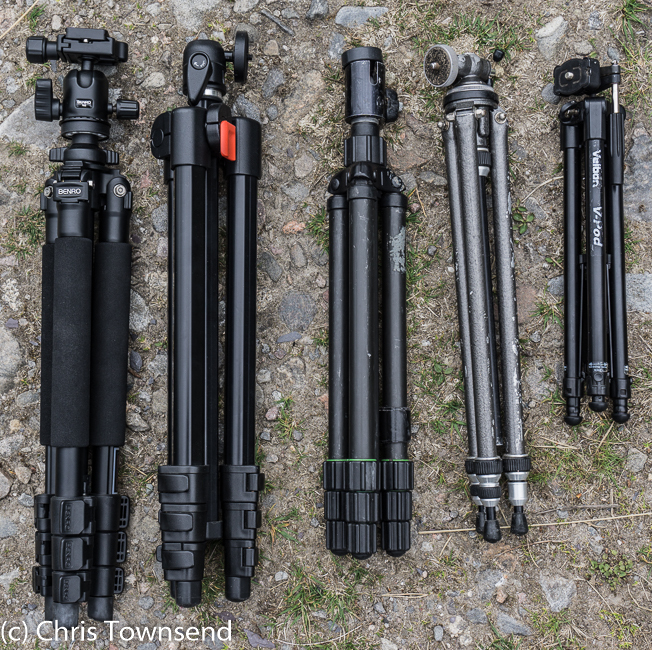 A dilemma for me too, I currently have about 5 tripods and not one of them is suitable for backpack trips so thought your article might be worth a read. Having Google, Amazon and eBay all of these tripods and cannot find one in the UK so sadly a bit of waste of time reading your article. Though not light in your summation but the lightest I would go for as a pro photographer is the Velbon Ultra 655 with a head of your choice. 1.3kg but a very good height in a smallish package. My big bugbear; that you might find something to note in your reviews is the ability or invariably not of attaching a tripod adequately and easily to a regular backpack. I don't use a 'camera' pack as they are too heavy, over priced, over padded for light kit and your damned if you need to fit in more than a camera. A regular backpack is the answer using padded modular units for storage (ie. Goin DSLR SLR Camera Padded Shockproof Foldable Partition Insert Protective Bag - variations and prices available but all from same factory) however try finding a suitable 30-45ltr pack - seems to be my lifelong quest:). One that allows central hanging and /or has a side bottle pocket strong enough for a tripod. Any suggestions welcome as my Dakine is still on the heavy side, the side snow shovel loops are were I put my tripod on that. I am a pro photographer I guess - at least I'm paid for many photos that are published every year. I guess it depends on your camera gear. The Velbon V-Pod is fine with small mirrorless cameras like the Sony a6000 and NEX 7 that I use. It wouldn't be ok with anything much heavier. Packs are a problem. The V-Pod fits in a pocket of course. 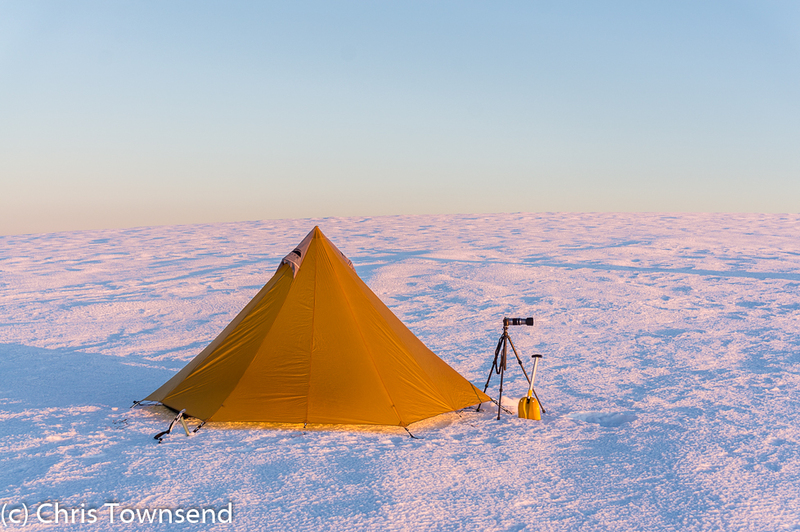 The best I've found recently for bigger tripods is the Fjallraven Kaipak 38. I carry my cameras in ThinkTank Mirrorless Mover bags slung across my body. Spare lenses, if carried, go in the pack in Zing neoprene bags. A heavier tripod is a must for me as I also frequently do panoramas and use a pano rig on top. Anyway what I use now is a feather compared with my Benbo that I used to carry up hills. Fjällräven do some nice kit (touch pricy), good memories of a jacket I used to own. I had looked at (online) there Abisko Friluft 35. Arc'teryx axios was another option and there are a few other Arc'teryx packs that nearly or could fit the bill. There are many packs that just about do but their side pockets are a failing, designed for water bottles they are just too lite a material for tripod legs to stand in. Or just no strong available strap points. Quest continues. Keep up the good work. The Fjallraven Kaipak 38 side pockets are mesh - tougher than on most packs - but the base is really tough solid fabric that should take tripod legs fine. An interesting article this Chris. Personally I now use two Sirui's. My full size one is a T2204X and my smaller one is T025X which even with an SLR isn't too much of a compromise. I don't use a camera pack either, I have an F Stop insert inside a normal bag. Seoras, I use a Gossamer Gear Gorilla on overnighters and a Osprey Exos 46 and either of my tripods are easily accommodated in the side pocket/straps on each of them. Thanks Wayne. The Gorilla is well named, serious bit of kit and price to match but if it serves the purpose... I'll study it further and see what else they do. There is one other I had looked at and not mentioned that I thought looked a possibility, its the MindShift Ultralight, not the 360° versions that have a pointless for me swing internal bag arrangement that adds extra weight and wastes space. MindShift are from what I gather an offshoot of F-Stop. F-Stop are highly regarded but there is something just not quite right for me with them - over engineered over hyped perhaps. Small correction: Mindshift Gear are a sister company of Think Tank Photo, not F-Stop. There's quite big difference in the reputation of those companies. I own two MSG bags, the r180 Horizon 34L (1.8kg) and the BackLight 26L (1.8kg), and am quite happy with both ones. Though for proper ultralight purposes I use other non-photographic backpacks with inserts for lenses/cameras. Thanks for the info. I use ThinkTank Mirrorless Mover bags and am very pleased with them. I use Zing neoprene bags for any lenses I have in the pack. Thanks Wayne. The Sirui tripods look good. The T025X would be a good replacement for my Cullman. I bought Velbon Summit a while back after the V-Pod was discontinued. I added a ball head mount from Amazon for about £6 I think? Its a tad rickety but with calm conditions and a lighter camera like my Sony a6000 its fine. 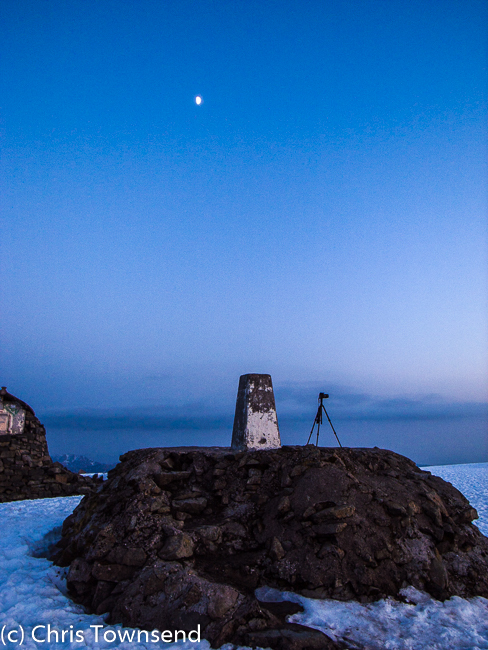 I did consider the Mefoto Backpacker Air tripod at 900g £100, and it looks like a proper quality piece of kit. But I really want to keep the weight down. To stabilise my light tripod I fixed a length of springy shock cord with a loop on the end to the centre column, I then place my foot in the loop and push down so pinning the tripod to the ground. That's a good idea. Thanks.